When we talk about a ‘solid’ wood floor, we mean one where each plank of wood has been milled (cut) from a piece of felled timber. Although it has been shaped, kiln-dried and sanded, each plank is basically wood in its ‘raw’ form. This is the traditional way to make floor boards, and still far more common globally than the newer ‘engineered’ planks. In a word, no. The word ‘solid’ is one that normally conveys qualities like sturdiness and resilience, so you could be forgiven for thinking that this is the best type of wood flooring. However a solid floor is almost certain to be less stable than an engineered one. By that we mean it will not withstand variations in the humidity of its environment as well. What is ‘Stability’ and Why is it Important? A wood floor reacts to differences in room temperature caused by the changing of the seasons, or modern heating and cooling systems, because these changes cause differences to the moisture content of the wood. As our founder Mursel says, it helps if you imagine wood as a living material with ‘veins’ (the grain of the wood) that can hold water. These veins will swell or shrink as they either absorb water from or release it back into the atmosphere. The piece of wood therefore expands and contracts – and as the grain is not perfectly straight then the expansion and contraction will vary even within one single plank. Why is Solid Flooring Less Stable? The thicker the piece of wood, the more water it can take on or give off, and therefore the more it can expand or contract. This means movement. Sometimes this is not noticeable, sometimes it is. A solid piece of wood is more prone than an engineered plank to expanding in a warmer/drier environment and shrinking in a colder/wetter one. And that’s not all – because a wooden floor is made up of planks fitted tightly together, each plank is subject to not just its own internal movement but to the movement of neighbouring planks that press against it. The exact movement in one plank – let alone across an entire floor – is very hard to predict, but one thing is certain: whether they shrink or expand, the floorboards will deform. The wood can bend and twist; sometimes boards will lift up from the floor; sometimes the middle part of the board will lift up, taking other boards with it; sometimes boards will crack. All of it means disaster for your floor. Are There Any Advantages to a Solid Floor? 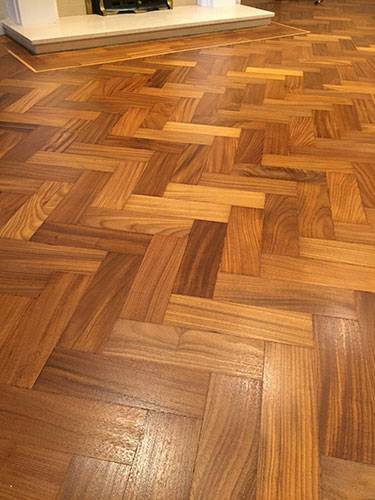 The only advantage is that a solid parquet floor can be sanded more times. In practice this is rarely an issue during a customer’s lifetime, unless the floor is somewhere where it gets a massive amount of wear and tear (in which case it probably was not the best choice of flooring). So Why Do You Even Sell Solid Floors? in some rooms it is the only option, and it is always the better option. We will decline to supply and fit a solid wood floor for a customer if we feel that it will not stand the test of time. NEVER install a solid floor if you have underfloor heating. NEVER install a solid floor onto a concrete sub-floor. NEVER install a solid floor in a room that can get damp or cold (e.g. a basement or bathroom). A solid floor is usually suitable if you currently have wooden floor boards. We recommend a plywood base over the existing boards, then either gluing or nailing the solid planks to this base. What are the Best Wood Species for a Solid Floor? In our opinion trees from the following species are all capable of producing high quality solid planks: Bamboo, Cherry, Jatoba, Hickory, Canadian Maple, Teak, Brazilian Walnut and Wenge. We have never been asked to source most of these, and we prefer to use wood only from a small number of hand-picked suppliers. As a result, we currently offer solid planks in Croatian Ash, Canadian Maple, Ukrainian Oak, Brazilian Walnut (parquet only) and Wenge. Is The Installation Process Different for a Solid Floor? Yes, in that the level of moisture in the room the floor is to go into must be lower (3.5% maximum) than it would be for engineered planks (3.9% maximum). Also, if the walls show signs of damp and the customer is not prepared to do the required work to stop the cause of this damp then we will not supply solid wood flooring (although in most cases we can offer engineered flooring instead). Read about how we help you to choose the right floor for you here. No matter the species, our solid and engineered planks both come from the same trees. Obviously the manufacturing process is not the same, but there is one other major and visible difference to your finished floor: the possible widths and lengths of the individual planks. Both are far less than an engineered plank of the same species, and this is due to the unavoidable fact that solid planks are just less stable. With a solid plank, no matter the species, the maximum width we will offer to supply and fit is 200mm, whereas we offer up to double that – 400mm – in engineered. When it comes to lengths, the maximum plank length varies according to species: for Maple it is 1.8m; for Oak or Walnut it is 2m; solid Ash planks up to 2.5m long are possible; and we can go to 5m with Wenge. However engineered planks in all species are available up to 7m long.